Norway’s Foreign Relations Minister Morten Hoglund called on President Enrique Peña Nieto’s administration to fully implement the free trade agreement between the two countries Tuesday, in order to attract large investments to Mexico. Commercial services and investments are aspects of the agreement which have yet to be completely incorporated. The Free Trade Agreement between Norway and Mexico includes a large portion of the exchange between the European and Latin American nations. The Norwegian government seeks to establish a bilateral agreement on commerce with the Mexican government. 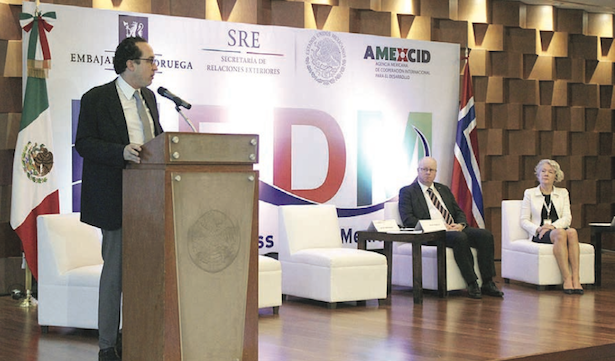 While inaugurating the forum for Norwegian Business Day in Mexico, the secretary said that the test of the free trade agreement is the opening of sea trade by the Mexican government and the recent approval of structural reforms which open the energy sector for private and foreign investment. The secretary said that Norwegian companies have emerged as pioneers in terms of cost effectiveness and environmental solutions for natural resource exploitation, especially offshore drilling. Norwegian companies have already established offices in Cuidad del Carmen. Four Norwegian companies have undertaken seven seismic studies for deepwater drilling, he said, the first time that foreign companies have undertaken this type of exploration in Mexico. During the forum for Norwegian businesses, hosted at the Foreign Relations Secretariat headquarters in Mexico City, the two governments sought to create alliances and incentive for investments, in the context of the structural reforms in Mexico. Specialists from both nations talked about the desire to attract investment from Norway and other international business leaders. The ambassadors praised the Mexican energy reform as one of the most important in recent decades. The Mexican government hopes that investment and shared technology will translate into better growth, jobs, efficient energy, exports and competitive prices.